play-off appearances. Bradshaw still holds the Super Bowl passing records for average gain per attempt in a career (11.1 yards) and average gain in a game (14.71 yards). He is a two-time Super Bowl Most Valuable Player and a four-time All-Pro. 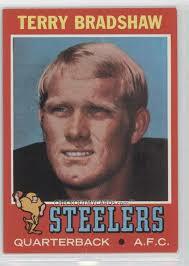 Bradshaw is the all-time leader in passing yards and passing touchdowns for the Pittsburgh Steelers. Pirates. He has also been named to the Louisiana Sports Hall of Fame, the Pro Football Hall of Fame and the College Football Hall of Fame. 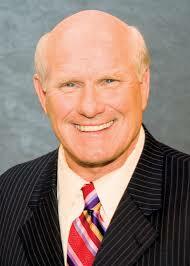 Bradshaw began his broadcasting career as a guest commentator in 1980. In 1984, he became a game analyst with CBS Sports. TV Guides Reader Poll named him America’s Favorite Sportscaster, and today he is recognized as an NFL studio personality with FOX NFL Sunday. His long list of accomplishments includes film actor, musician and author. Bradshaw appeared in the films Hooper, The Cannonball Run, Smokey and the Bandit II, and several TV shows. His most recent film work includes voice over in the popular 2005 movie Robots. He has recorded several songs and his single I’m So Lonesome I Could Cry placed in the Top 20 on the Billboard Country Singles Chart. He has written and co-written five books.